Sign up today to receive our FREE daily newsletter! Small Cap Daily is a FREE, daily investment newsletter that gets delivered directly to your desktop just minutes after the market’s opening bell. Discover the latest small cap investment news, ideas, views, and insights on what’s moving today’s market. Find out what you need to know to make intelligent small cap investment choices and potentially grow your money. Economic trends, research reports, gold, silver, oil, interest rates, CEO interviews, top-performing stocks, investment fact sheets, and more – it’s all covered in The Small Cap Daily. To subscribe, just enter your email address and click the button below. You can cancel your subscription at any time. To ensure delivery, please add [email protected] to your white list. See white list help for details. What can The SmallCap Daily do for you? 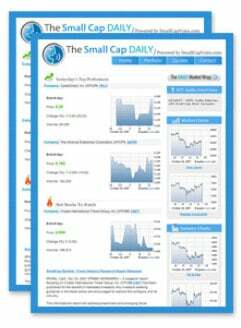 “The Small Cap Daily“ newsletter from SmallCapVoice.com, Inc. tracks SmallCap stocks listed on the Small Cap OTC and Pink Sheet markets on a daily basis. We provide our readers with important information to assist in SmallCap investment decisions. Anyone venturing into the SmallCap market needs to be armed with as much timely due diligence as possible, but most investors become daunted by the shear volume of information available. We organize the data and provide useful tools such as research reports, audio interviews, stock charts, investor fact sheets, and much more so you can have the most up to date SmallCap Market, OTC and Pink Sheet information available to you right in your email box. This information can help investors identify and track SmallCap stocks that are on the rise and positioned for success! Timing is everything and we can help investors succeed, let the The Small Cap Daily provide you with all the tools and information needed to make informative investment decisions.